Hiring a quality good carpet cleaner or company goes beyond opening the phone book or conducting a random Internet search too. In fact, carpeting is one of the home’s best assets so everyone needs to make sure that they’re hiring an experienced professional who will do the job right. Learn 6 Costly Misconceptions About Carpet Cleaning, 4 Recommendations & 6 Questions To Ask a Good Carpet Cleaner Before You Invite Them Into You Premises. 1. You should wait as long as possible before your carpet is clean. -No. Dirt is abrasive and it’s like sandpaper. Every time you step on your carpet, you grind dirt into its fibers. A dirty carpet will not last nearly as long as a clean carpet and with the help of a good carpet cleaner tool like a vacuum – but by itself is simply not enough. In this case, you need a dedicated team of experienced technicians. 2. The only reason to clean your carpet is to remove the dirt. -No. Indoor Air quality experts say, “once a carpet looks dirty, it’s really filthy and filthy carpet can be a serious health risk especially since New Zealanders spend 90% of their time indoors”. If you have allergies, asthma or any other breathing problems, one major source could be the pollen and dust mites in your carpet. To achieve 100% clean, you should also eliminate bacteria, chemicals, and tobacco tar residue. 3. One method to clean a carpet is as good as another. No. You can choose from 2 primary methods of carpet’s cleaning machines: Dry chem cleaning or hot water extraction. First, I’ll explain the dry chem carpet’s cleaning. Many people believe that dry cleaning carpets is like dry cleaning your clothing. This is not true. All carpets cleaner use water in one way or another. This is also not true. Here is the main method of dry chem carpet’s cleaning. When the dry chem method is used, the carpets cleaner uses a machine similar to a floor polisher spinning a large cotton bonnet from side to side, absorbing dirt that in the carpets, it’s like trying to rub the dirt out of carpets with a large towel. Can you imagine doing this to your hair? Whilst this method can be useful as an interim carpet’s cleaning, it can leave a chemical residue in your carpets, which is the main reason dry chem carpet’s cleaning is not very effective. The second method to clean a carpet is called hot water extraction. This method is also referred to as steam cleaning. 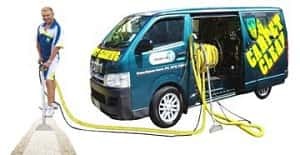 It’s not a surprise that the truck mount extraction gives a much more superior carpet cleaning because it heats the water up to a higher temperature and shoots less cleaning solution into the carpet at a higher pressure which breaks up the dirt and bacteria. The machine itself uses higher suction to draw the dirt out leaving a drier finish. This is the method Graeme’s Auckland Carpet Steam n Dry use and is by far the most superior method to clean a carpet in the world today. It’s like when you have a shower you rinse off the dirt and soap – for cleaner carpets. Shaw Industries, the world largest carpets manufacturer recommend hot water extraction truck mount carpet cleaning. In fact, it’s part of their carpet extended warranty plan. Dupont 3m international and the New Zealand wool board also recommend this method of carpet’s cleaning. You can choose from 2 different types of hot water extraction carpet’s cleaning: Portable extraction, which is a smaller carpet’s cleaning machine for the home carpet steam cleaner’s novelist. 4. Having the right equipment is all a carpets cleaner needs to clean your carpets properly. Some carpets cleaning companies may own good equipment, but the employees may not know how to use it correctly. This is why it is important to choose your carpets cleaner carefully. The best carpet’s cleaning companies are those who are certified by the International Institute of Carpet Restoration and Cleaning Certification, known as the I.I.C.R.C. A company that clean a carpet cannot buy this certification. The carpet cleaners must earn the certification through study, experience and successful completion of formal written examinations. Carpet Cleaners who are certified by the I.I.C.R.C have, in effect, earned a degree in carpet’s cleaning. 5. Carpet cleaners that offer the lowest price is the company I should hire. -Maybe but not always. Here are 2 important points to consider. -Normally yes, but not always. Set in stains like dye, pH burns, cordial, and pet urine may not come out completely with any washing process. Second, the amount of soiling.